If you’re buying a used iPhone or repairing an iPhone, you may wonder if you can find out if the iPhone was bought as new, is a refurbished model, or is a replacement device provided by Apple via a service request. Wonder no more, you can use an interesting device model identifier trick to discover if an iPhone is new, refurbished, a replacement, or even personalized by engraving. This can be helpful information for buyers of used devices, if you’ve received a device as a gift or hand-me-down, if you’re troubleshooting or repairing an iPhone, and more. That’s all there is to it, now you know how to determine if an iPhone is new, referred, replaced, or other. It’s possible there are some other identifier prefixes for iPhone devices that aren’t listed here, if you know of any do share them in the comments. I have tested this with a handful of my own iPhone devices that I know are either new, refurbished, or replacements, and it has held up. I haven’t personally seen the “P” identifier however. 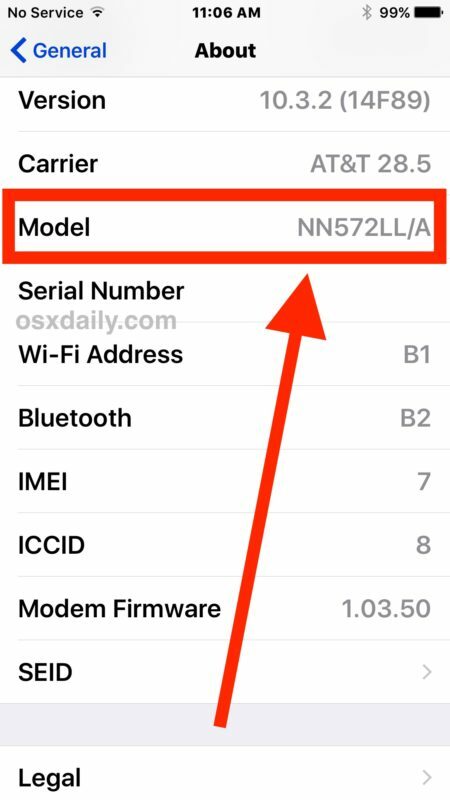 By the way, it’s important to note the model identifier shown here (like MN572LL/A) is different from the general model (like iPhone X) and model number of the iOS device (like A1822) – admittedly a bit confusing since they all have similar labels, but they are indeed entirely different things. You can use similar tricks to sort out some details about iPhone devices by retrieving the iOS device serial number and then reading it too. Thanks to a helpful post on the Apple Discussion forums for this neat little trick. My iPad has ingraving which is termed personalized, but had the model identifier “M”. According to the article it should be “P” instead of M.
Same here with my engraved iPad Air 2. I have the same comment as Pat. My iPad is engraved, but is marked M.
It was actually very informative, never knew this about iDevices. More great intel from OSX Daily. The last site for actual MacOS and iOS knowledge without all the fluff. Thanks for a great website. Is there a way to tell whether a replacement is new or refurbished? Rubbish. I’ve looked on my old iphone which was purchased ‘’almost new’’ from Vodafone and has the initial M like brand new. It wasn’t brand new for sure because of the faults it had. At least I’ve paid the right price for it. I would suggest any phone sent back to apple for any reason is going to have the appropriate code. If the phone was a simple return to Vodaphone, and never sent to Apple, they are going to flip it and thus no M.
How does the iPhone’s firmware know to update itself if someone replaces a cracked screen? How does the phone’s firmware know to update itself if someone sells their iPhone. 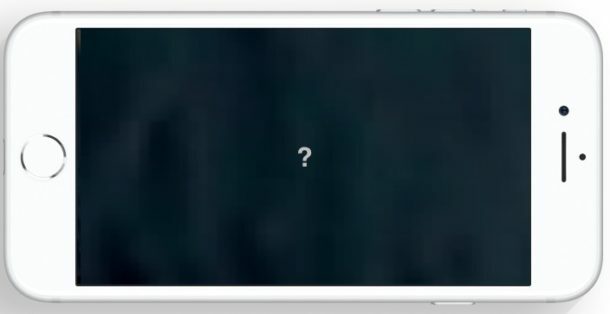 I may be that the person in an Apple store performs a tweak on the iPhone appropriately, but if I were to sell my iPhone to someone else, how would that be recorded? Not true. Got a replacement today. It has an M for new. Samuel, it is true that M is a new device. As for your replacement, you were given a new device. OK. Great job. That means someone at the Apple store gave you a new iPhone as the replacement rather than go through the standard replacement process due to service request, maybe as even refurb or repaired. How to know if u bought it second hand n the guy got change the spare part inside? The first character will change? Ive got a few questions: If I get a replacement with the N it means it was refurbished then? Or there is some difference between N and F devices? I have the same question Francisco was asking. I got an replacement ioad pro directly from Apple with Modelnumber NPL… Is it a new device that came with a different packaging or is it a used and refurbished one? Thanks in advance! How about ME336J/A? is that original or fake or what? Thanks very much this is the only site i got my solution…..
Is this serial number system the same for the airpods? my iphone storage is 64gb but when i check its original specs was 16gb. how this can happened? If the phone model starts with 3DLLA is that refurbished or not ? rubbish. anyone can refurbish an iphone and the letters wont change..
cocopots you aren’t really familiar with any technical topics and that is clear, so here’s an explainer since you didn’t read the article or understand what any of this means: factory refurbishing is handled by Apple, it involves refurbishing an iphone returned to them for any reason, perhaps even changing components. That is different from some ‘anyone’ rubbing an iPhone with a damp rag and then erasing it to sell it to you on ebay or craigslist. Grok that? Probably not. – Device was used, internal workings checked and cleaned up with new battery, new casing and OS reset AND the Cellular LIFETIME call time is RESET to ZERO! – Device was ‘more’ used, internal workings checked and cleaned up with new battery, new casing and OS reset BUT the Cellular LIFETIME call time was NOT RESET so LIFETIME call time remains from past owner. You won’t know which one you’ll get if you buy the Refurbished version even if it’s bought directly from Apple.com. Obviously, the ‘better’ version is (1) when it’s ‘used’ than completely refurbished. Found that out when I bought my iPhone 6S Plus from Apple.com! Refurb models can be sold directly at Apple.com or by resellers, the latter of which you need to be very cautious as you don’t know if the devices were tampered with by the resellers. Good news is that you can still buy the iPhone Applecare for Refurbed iPhones. I purchased Iphone 6plus and there model number is (NGAC2ZP/A) = A1524 but i do not know that it is new’ referbashed or replaced. Plz tell me. Your comments and feedback will be greatly appreciated. If your model number starts with N means, it’s a replacement phone. If my mobile starts with F means confirmly is it Refurbished? No one has answered if a replacement unit is a new or reburish unit? If I got a replacement device, how do I know if it is new or refurbished.